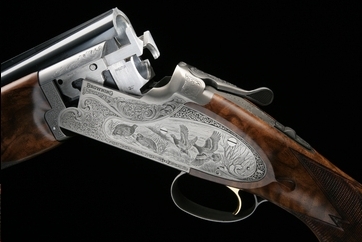 Here is the top of the range in Browning over and under shotguns. The Heritage model is the heir to the B25 side-plated model, and possesses all its elegance. The hunting scene engraving combining partridge and pheasant is remarkably delicate. The stock is made from top quality, carefully oil-rubbed walnut. With its half-pistol stock and its tulip fore-end, the gun pays real tribute to the B25, and is the worthiest of heirs. You may order these guns online, however due to UK laws, we are not permitted to ship directly to you, we can however ship to a registered firearms dealer local to you. Once we receive your order, we will contact you to arrange which registered firearms dealer you would like the gun to be shipped to. 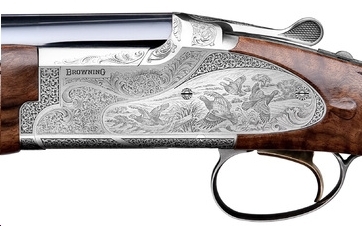 Available in 20G calibre, the Heritage Hunter 20G is a model of perfect balance, delicacy and ease of handling. It possesses a half-pistol stock in superb oil-rubbed walnut. Partridge and woodcock are magnificently represented and enhanced on its low, thoroughbred action frame.